Joseph Kyle was born February 24, 1923 in Belfast, Northern Ireland. In 1930. Kyle moved to Saskatchewan, where he lived throughout the depression, before joining the navy and relocating to Vancouver a decade later. After four years of naval service, Kyle moved to Montreal in order to study music composition at McGill University. There, Kyle worked under the guidance of Violet Archer, Larry Summers and Robert Turner (who became a lifelong friend and influence). Eventually Kyle returned to Vancouver; and, in the mid‐1960s, worked as a producer for the Canadian Broadcasting Corporation. During that time he travelled to Japan to film a documentary series with Alan Watts. Shortly thereafter, Kyle became a member of the Faculty of Education at Simon Fraser University, and, in collaboration with Victor Doray and Jack Shadbolt, pioneered the Intermedia Society: an avant‐garde learning facility that encouraged experimental, interdisciplinary art practices. Kyle was director of Intermedia from its inception until 1970. In 1973 he moved to Victoria, B.C., where he founded the Victoria College of Art and served as principal for 25 years, while also maintaining his own art practice. Kyle painted steadily for 30 years, citing music as his primary source of inspiration and as a means of accessing an altered state of consciousness. Throughout his career as a painter, Kyle was influenced greatly by the Westcoast art scene of the 1960s. His background in contemporary classical music composition was also a key inspiration in how he approached painting, and, although some might categorize his work as geometric colour‐field abstraction, Kyle rejected this term instead favoring “Syn‐optics” – a description he originated and felt best represented his work. Syn‐optics is Kyle’s contribution to abstraction. Unique in concept, Synoptics refers to “seeing as a whole”. It is the ability to synthesize shape and colour on an equal footing and not as one reflecting or enhancing another”. Kyle’s work forces the viewer to perceive an entire painting as an interactive whole rather than an assembly of individual compositional devices. Like Op Art, both vibrating colours and pulsating patterns are characteristic of this genre. With Syn‐optics, however, Kyle moved into new and original territory. Though public exhibitions of his work are rare, Kyle’s work has been collected by a number of important private and corporate collections throughout Canada. His last commercial exhibition was with Buschlen Mowatt Gallery in Vancouver, BC in 2002. 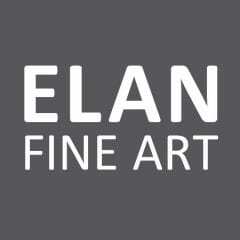 Since then, he has been represented exclusively by Vancouver‐based Elan Fine Art Ltd. A travelling exhibition and catalog are also pending.